VMA 2014 will only be memorable for one thing – Beyonce’s mini-takeover. The ‘Drunk in Love’ songstress was the most anticipated act since God knows when. Aside from a welcomed interlude courtesy of Usher, all the other acts were fillers. As a recipient of MTV’s Video Vanguard Award, the proud mother of Blue Ivy demonstrated why she deserves to be unabashedly feted. She drowned us in a pool of melodies extracted from her self-titled album that I am quite certain changed the lives of many who dared to venture. Every move, every thrust and every hair flip added up to a remarkably fulfilling display of perfection. 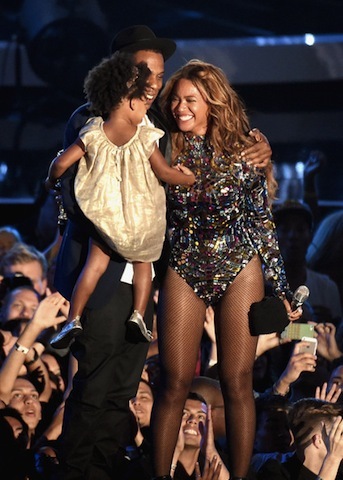 And lets not forget the grand finale that saw her accepting her award from none other than her rumored soon to be ex husband Jay-Z and the unbearably adorable Blue, who seemed to grasp the fact that her mother had just floored us with her unquenchable talent. Beyonce’s accumulated hard work has paid off. From Destiny’s Child to her prominence as a solo artist, it is clear that Queen Bey’s ascension to the throne wasn’t an overnight occurrence. She has been working at it for quite some time. Even as far back as when another treasured crooner was wowing us with her charismatic energy. 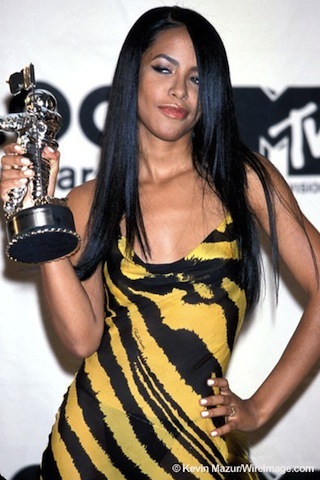 Aaliyah, died on this day, 13 years ago. She was only 22 years old. Her death in a plane crash after filming what would tragically be her last music video definitely left a void in the industry and left her fans devastated at the thought that we would never see “Baby Girl” convince us to ‘Try Again’. Ever. She would have been 35 years old, making her a couple of years younger than Beyonce. It’s only natural to wonder what she would have been up to if she had lived. The projects that were left unfulfilled suggest that she was certainly taking her then burgeoning acting career quite seriously. Her final album, which ironically was self-titled, shared similar attributes as Beyonce’s wildly acclaimed confection. It signified her ascension into womanhood as well as the self-realization that comes with such an honor. There was very little doubt that Aaliyah was in exploratory mode, especially with tracks like ‘Loose Rap’ and ‘More Than a Woman’. ‘Those Were The Days’ is also a favorite. Much like her counterpart, the ‘Back and Forth’ singer started quite early to hone in her skills. She arrived on the scene as a silk voiced tomboy and eventually evolved into an effortless beauty brimming with stylized elegance. Two women with similar projections, and one dream that ended too soon. As Beyonce basks in the glory of her achievements, it’s only fitting to pay homage to another Wonder Woman, who left behind a body of work that will continue to inspire us for generations to come.